This book is written with a slightly different perspective to those that have come before it, dealing with the economically and socially ring-fenced community of Rhodesians that had fought to uphold a very privileged way of life. It did so under the duress of an escalating black nationalist insurgency, a nasty trade embargo, and a pending, yet inevitable, collapse in the late 1970s. This was of their own making with an illegal UDI becoming their greatest betrayal in the end. Ellert strives to identify the ethos of ‘white nationalism’ within a grouping, some of whom had their heads deeply buried in the sand; its weaknesses; and the reasons for sustaining its struggle. And he does so with a rather brutal trip down reality lane, but, perhaps, with a little admiration for the Rhodesians who went on; right to the bitter end. The history of black struggle and its cause was often ignored by white nationalism and it remains little understood by most whites and some blacks, even today. The evolution of indigenous nationalism, reborn from the smouldering embers of the First Chimurenga, has a history rich in both cause, its protest and the heroics of often lone agitators trying to foment change, which re-ignited those embers in 1964. Yet it is littered with political ineptitude, internecine squabble and tribal divide, so much so that a nation went to war with itself; in more ways than one. Henrik dedicates space to the growth of nationalism, but perhaps fails to unfold the entire picture, concentrating on the first flames of the second revolution which were mercilessly snuffed out by the Rhodesians. Rhodesians just simply failed to recognise the impact of the land issue and the polarised demographics, but their real unhinging began in 1972 with the liberation movements, still licking their wounds, crossing the Zambezi, their own Rubicon if you like, with a paradigm shift in guerrilla strategy. This resulted in the opening up of Operation Hurricane, to which the author dedicates a chapter. The origins of this book quite clearly lie in Ellert’s first book, ‘The Rhodesian Front War’ (Mambo Press, 1989), and he dedicates chapters to areas with which he had deep experiences. These including the media, infiltrated as a Rhodesian intelligence officer, the British South Africa Police, his regiment, and the Central Intelligence Organisation of the day. We still need a more definitive history of the latter. The most feared Selous Scouts Regiment also gets its chapter and some may be none too pleased with its content. The germane factor which turned the tables on Rhodesia is with little doubt the collapse of Portuguese rule in Africa, especially the fall of Mozambique, ending 470 years of colonial rule. The events that unfolded in late 1974 eventually allowed the Zimbabwean insurgency to proliferate along a longer front, and escalate into a bush war of almost conventional proportions; thus stretching the Rhodesians to their limits. The author well covers the colonial war in Mozambique; the chicanery of Portuguese politics and the military; and the loss of one of Rhodesia’s great allies. The Portuguese actually saw the light, well before the Rhodesians. This book would not be complete without a chapter on the treacherous South Africans, or rather its politicians, who first nurtured Rhodesia’s counter-insurgency with manpower, aircraft, materiel and munitions; saturated the nation with its observers and spies; even unleashed its experimental, biological programs; and then dropped the nation, incredibly, like the proverbial hot potato. This topic is, of course, linked to the sanctions war to which Henrik also dedicates a chapter. The South Africans were often instrumental and were the principal conduit for essential sanction-busting needs, but they also turned this against the Rhodesians. As an interesting observation, Ellert believes that Rhodesians have perhaps missed the boat on decolonizing their history, but one might suspect many are happy they did, when reflecting on the most appalling ruin that Zimbabwe now finds itself in. Echoes of that “old pariah, defiant and bigoted to the last… with the familiar Smithy whine: ‘I told you so’” (Smith Obituary – The Guardian 21 November 2007). Zimbabwe is perhaps unique in that most of its military history has been written by the vanquished, and we are yet to see an honestly written definitive history of the struggle, without political agenda. The reviewer was a little let down by out of perspective pictures and the poor print reproduction of images, especially a few illegible charts. Regrettably the indexing leaves a lot to be desired. The sequence of chapters is a little disjointed too and content is a touch iterative in places. There is even a chapter concerning the military coup d’etat, that wasn’t, and the ascension to power of Mnangagwa, post Mugabe, that, in the writer’s opinion, is superfluous to the plot. Never-the-less, this book is a ‘must read’ for the gullible many, who have been subjected to decades of the lies and mistruths championed by politicians and their cohorts on both sides of the fray. US$40.00 – soon to be available through retail outlets. Publisher Dust Cover Review: This is the first history, which covers both wars in a single volume, allowing the reader to see how they flowed seamlessly into one another and how they impacted on the southern Africa. Written in Ash’s typical no-holds-barred style, the book thunders along rather than tiptoeing round modern political niceties. Special attention is given to the many outlandish characters of the period: old-school savage tyrant Chief Lobengula, the ambitious and ever-scheming Cecil Rhodes, and the rascally Dr Jameson, of course … but also men like Captain Lendy, one of very few men in history to have died from putting a shot, Frederick Selous, the archetypal great white hunter, Kagubi the infamous witchdoctor who whipped up so much trouble during the rebellion, not to mention the likes of Plumer, Forbes, Wilson, Colenbrander, Burnham, Baden-Powell, Gifford and the extraordinary ‘Maori’ Hamilton-Browne. Indeed, the cast is probably the most fascinating part of the tale: adventurous young Anglo-Saxons from every corner of the empire and a few old Indian fighters from the American West, who all found themselves thousands of miles from home facing a valiant and terrifying enemy. 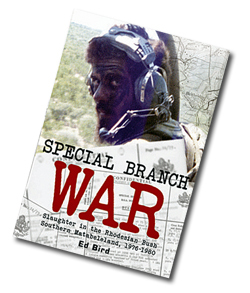 Having served in the same organisation and unit as Ed Bird, and indeed having visited him on several occasions at the border station where he served, I was obviously pleased to receive a copy of his book, Special Branch War. The Special Branch (SB) station in Beit Bridge would have been a popular posting during times of peace, but the advent of a bitter counter-insurgency campaign put paid to that. What’s more, the station was unique in that its area of responsibility fell within two operational areas, JOCs Repulse and Tangent. Bird, twice decorated while in the force, joined the BSA Police in June 1964 and served as a District policeman in the then Victoria Province. With the 1972 escalation of insurgency agitation in the north east of Rhodesia, Ed soon found himself embroiled in intelligence work as an attaché to SB in the Zambezi Valley, as many of us did. The author was eventually transferred to the plain clothes branch of the police and invited to join SB. He was involved in the early establishment of a section experimenting with pseudo-terrorist operations; a forerunner unit and indeed the SB origin of the Selous Scouts, later formed by the Rhodesian Army. Ed Bird was at one time an SB Selous Scouts Liaison officer. Bird manages to describe life on an SB station in an operational area very well. He tells of the, hereto generally unknown and unsung, commitment, huge risks and sacrifices made during the ‘hondo’ by many dedicated members of SB. Exposed are the frustrations of intelligence gathering with counter-insurgency work, where useful information often fell on deaf ears, or where the clue-less, who should have known better, could never use the ‘int’ efficaciously. But there were exceptions, brave men who took to unconventional, if not dirty, tactics and with whom lifelong friendships endured. One point will be clear to anyone who reads this book. That is the magnitude of ZANLA operations into the south east of Rhodesia, then on its last political legs after being sold out by foreign influence, including that of our then erstwhile neighbour, South Africa. The south east was a vital communication link for Rhodesians to the south and ZANLA’s strategy was for full scale conventional warfare in the south, aided by regular FRELIMO infantry. The pounding taken by those who plied the two major routes to Beit Bridge is ever evident as you page through this book; nauseatingly so. Unfortunately there is criticism. While it is acknowledged that much of the source material for this book was an SB incident log, maintained by the station in Beit Bridge, its verbatim, SITREP like, extract in the book does tend to be repetitive. Personal issues aroused after being dropped for promotion detract from the real story that Bird has put together so well, but then personalities were all a part of it. The book is a good read, especially for those who were involved in the fray. Ed Bird joins a list of former servicemen committing their experiences to paper for posterity, clearing the fog of political falsehoods with the truth. I recommend this book. Published by Masai Publisher, Inc. I suppose when one settles into an autobiography in which many of those named are known to you, one acquires a sense of comfort. For Rhodesians who did any time in the military or associated services, the surroundings are familiar, you have been there before and you have stepped in the footsteps of the author. 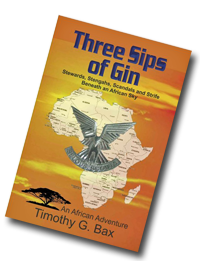 Three Sips of Gin goes a little further though, outlining a unique adventurer’s story of professional soldiering in Africa. Born in Tanzania and raised partly in East Africa and Canada, Bax ends up on the receiving end of a vicious insurgency in the heart of Africa. The author was weaned on danger and yearned much for the adventure of Africa, receiving his fair share of it. He suffered serious wounds during conflict with terrorist gangs mostly on foreign soil. Bax introduces you to the rugged life of the Rhodesian Light Infantry, as a miserable, non entity recruit, and then, following an abrupt metamorphosis, his status as a proud and highly respected trooper in an elite commando unit at which he apparently excelled. Tim soon finds himself on officer selection and on the hallowed parade grounds of the Rhodesian School of Infantry. The book presents the reader with more than just ‘war stories’ and Bax blends in many light hearted and humorous anecdotes of his life in the services, in which he pokes fun at military establishment, the espirit de corp and merriment of the Officers Mess, not to mention himself, if not in a slightly self-deprecating way. There is no conformity here and this rather explains Bax’s penchant for the unconventional and, perhaps, why he eventually lands up on selection for a place in the highly esteemed Selous Scouts Regiment. Readers will follow Tim Bax into the shadowy, top secret world of the pseudo-terrorist operations and thoroughly unconventional warfare. The Selous Scouts blends soldiers and captured nationalist terrorists into small effective units, trained to survive in an uncompromising and abrasive African bush, while delivering subterfuge, death and destruction to their foes in war. This book is a pleasant and easy read. It will bring particularly more delight to those who were there, but will provide an interesting perspective for those who were not. This is not some boring personal history, it is a well narrated, captivating, all absorbing read, and a must have for anyone interested in Rhodesia’s explosive counter-insurgency history. Bax should be complimented for adding to the ever expanding military book genre on southern Africa, particularly Rhodesia, about which much of the truth is fogged. Stu Taylor, perhaps not surprisingly, is still living in Zimbabwe. His book describes the life, abuse and hardships of a regular Rhodesian army soldier in the ranks and then Taylor’s struggle with civilian life, in newly independent Zimbabwe, after ‘de-mobbing’. It is a somewhat capricious account, which many of his contemporaries will find both amusing and tragic as he reflects, in his own humble, often belittling way, a seemingly superfluous, sometimes bacchanal, existence entirely beyond his control. Despite this he keeps soldiering on, facing hurdles and obstacles, which most mere mortals will never meet. This is hardly a trumpet blowing account either, despite Taylor having served in the Rhodesian Light Infantry, a crack airborne unit, for thirteen years. His stories of combat hardly scratch the surface of what it was really like in the thick of battle, yet he captures the hard knocks shared by so many of his ilk during war, political transition and a peace which never really endured. 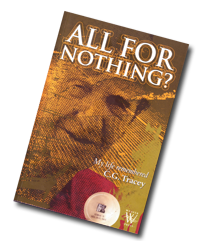 Tracey’s autobiography is a noteworthy insight into the life of an apolitical, but prominent, ‘Rhodesian’ farmer, from humble beginnings and limited education to one of the most influential and committed men in Zimbabwean agriculture. Tracey dedicated his years to farming and business, but more than anything he was notable in contributing to and promoting a nation through its political upheavals, trade sanctions, an insurgency and the subsequent peace and reconciliation. He was thoroughly dedicated to the new Zimbabwe, guiding many of its nouveau politicians. Tracey was a highly respected man of great ethical standing who knew no colour bar. Yet, all this was no getaway from the greed and ravages of Robert Mugabe’s destructive land reform policy, during which Tracey saw members of his family murdered, and he too being forced off the land by none other than a High Court judge and a senior army officer. Compelling reading for those who need to learn of the racial injustices perpetrated for a very select pecuniary cause.